You will supplement your text by focusing upon the physical and communication supports to enable students with physical disabilities to interact more fully within your general education classrooms. And, when you learn more about communication boards you’ll discover the application of these alternative communication devices for other students as well, such as those with autism. We’ll explore the physical changes that might need to be made within your classroom, and a few technology supports a high school student with physical limitations can use to do what high schoolers do after school. You’ll try out the accessibility features on your own computer (PC, with Office 2000 or newer). Then, you’ll make your own schedule board using Boardmaker or Bliss Symbols. You’ll notice within this text some suggestions that you learn to identify examples of 4 aspects of AAC, and the dimensions required for wheelchair users to navigate freely in your classroom. Physical and communication supports to enable students with physical disabilities to interact more fully within your general education classrooms. Communication is how we interact with the world around us. Through sight, sound, and body gestures we exchange information, express desires, and interact with others. Communication is how we express ourselves, our individuality, sense of humor, frustrations, and one way through which we connect with others. The ability to communicate is a major life activity. To communicate means to convey information. We generally do this through talking, listening, reading, and writing. We can further refine our definition of communicate to convey information through language. Yet that does not include gestures, such as a nod of a head or thumbs up to mark approval. Taking our definition one step further, then, to communicate is to convey information through formal and informal language. There are all kinds of ways to communicate. Mary Tyler Moore did it with a smile. Later in this session you’ll view a video clip of Lucy who nods her head to communicate yes and no. Facial expressions, gesturing, shrugs, and other body language are all aspects of informal communications that can enhance the meaning of what is being communicated. a creole (a combination of two languages) language, PSE – Pigeon Signed English. there is finger spelling. In America, finger spelling is performed using a single hand to create shapes that have a one-to-one correlation to the English alphabet. signing in a smaller visual area. For someone who is deaf, he or she may use sign language to communicate. For a blind person, he or she may use a slate and stylus to write. In this session, we will examine communications, assistive technology that supports communication, and finally, we’ll guide you in your search for products that may meet the future needs of your students. All of the examples above fall under the category of alternative communications, speech and listening being the “usual” way to communicate. So what happens for the individual who cannot communicate using the above methods? Gesturing can only communicate so much, even when supplemented by agreed upon “home signs” developed in the classroom or home. For that we turn to augmentative communication. If American Sign Language is an alternative means of communications, then what constitutes augmentative communications? For the purposes of this course, we define augmentative communications as the use of a tool to supplement the communications needs of an individual with a disability. What we won’t touch upon within this session are augmentative and alternative methods of reading and writing. For that we can use computers for people who have unintelligible handwriting, and add a speech synthesizer, a device that reads aloud text, to a scanner to read printed materials. The American Speech-Language-Hearing Association, ASHA, suggests that there are two components to augmentative and alternative communications (AAC), language representation and transmission. Language representation can be thought of as the symbols we use to communicate; for most of us the language representation is a combination of spoken phonemes to create speech. In sign language the language representation is the position, shape, and movement of the hands. Our printed alphabet is a symbolic representation of language. But how will the student transmit his or her representation of language to others, to communicate? Transmission of language can take many forms, including speaking, writing, keyboarding, smiling, signing and pointing. How about Morse code? It is a combination of dots and dashes, or short and long signals, which are translated into the letters of the alphabet, strung together and-- violà --the message is conveyed. In this particular case, the dots and dashes are the language representation. The device used to create the dots and dashes is the transmission device, or in this case the augmentative device. With computers today, it is relatively simple to have the computer automatically translate the dots and dashes (the language representation) into letters and then use a speech synthesizer to read aloud the message (the transmission of the language). Another definition of ACC also includes the language representation (symbols) and the transmission (called techniques), and reminds us that augmentative and alternative communication also contains the device itself (referred to as aids) and how the aid is used. The term “Aids” refer to a physical object or device to assist with the communication process (e.g., board, chart, device, computer, fingers). “Techniques” refer to the way in which messages are transmitted (e.g., scanning, encoding, signing, natural gestures). All these interventions come from both augmentative and alternative approaches”..
Augmentative and alternative communication (ACC). What is augmentative and alternative communication (AAC)? through the Legal assistance link. This link, http://www.specialed.us/autism/structure/str11.htm, provides a basic definition of visual schedule and gives several examples. Visual schedules and choice boards are not the same. Read about the difference between the two at http://www.iidc.indiana.edu/irca/communication/choicebrd.html . Switches offer access to anything electronic for persons with disabilities. They are a great way to begin experiencing independent control. Through a variety of interfaces, and now through the USB port, switches are connected to electronic devices, including computers. They work to turn things on and off or indicate choices when used with scanning software or interfaces. For children with physical disabilities, a single, reliable movement can cause a toy to move or turn a radio on. Those with sensory impairments learn that they can be the controlling source of sound, light and vibration. Children with cognitive impairments are able to interact with toys and computers with a single "button," limiting the need for more complex directions. making choices to indicate preferences. These skills provide a foundation for learning and for more complex technology use such as multiple switch use and more extensive environmental control. Below is one picture of a switch used to activate other devices. Switches sometimes must be mounted in place to make them easier to use. This provides stability for the student by ensuring that the switch stays in one place! For push switches we often use pieces of sticky-backed Velcro to hold them in place on a table or desk. For students who access switches in other ways, a mounting system may be useful. Mounts described below hold up to 5 lbs. They are useful for mounting switches or lightweight communication aids. The keyguard is an overlay with holes cut in it that correspond to the keys on the keyboard. It fits to a user's keyboard and can be useful for people who tend to hit more than one key at a time, or who fatigue and need to rest on the keyboard while typing. Custom keyguards are made to fit any keyboard. To create your own communication board using Boardmaker, first complete these following 2 activities and review the information about Boardmaker foreign languages, and use of digital pictures. Then, generate your own communication board containing the 6 aspects listed below. Submit finished communication board by Monday, December 6th. Software for Printing Anything as a .PDF file. You might need to copy the links and paste them directly into the Internet URL. If the link then doesn’t open, look for a yellow horizontal line that might appear across the top of the window informing you that your own computer program had blocked opening the link. Just click the link within the yellow line and then select the option to open it. Each picture communication symbol is translated into 24 languages and may be found in the Boardmaker database, and printed in any of the languages. This means that you can build a communication board in any language without being able to speak it. Symbols may be copied with 1) no text above the symbol, 2) one language above the symbol, or 3) any two languages above the symbol. Additional languages may be added by typing over existing languages. Photographs taken with a digital camera or photos scanned in with a flatbed scanner can be added to Boardmaker libraries. Pictures of familiar objects are often used to introduce a person to a communication board and then the picture communication symbols are substituted, systematically, as communicating with a board full of graphics becomes more fluid. Create a communication board for a student who is unable to speak clearly, such as someone with some aspects of cerebral palsy. Use Boardmaker or even Bliss symbols if you prefer, and make a board by selecting pictures. You decide what the student's board will contain. For example, you might decide that this board is to be used for morning circle, so it will contain pictures about the weather, calendar, and whatever else students must communicate about during morning circle. Or, you might design a board where the student communicates preferences for recess and play time, or for learning about the science unit, or about a literature unit, or participating in a Social Studies small collaborative group--you decide, then generate a communication board containing 12 pictures that meets the criteria below. Print it out and bring it to class on December 6th. For your student who would benefit from use of a visual display ACC, please construct a communication board with the following features. You do not have to always create your own individualized visual schedule or choice board. Boardmaker communication boards, topic boards, and social stories, are already made. For example, you might “Google” Boardmaker examples, Boardmaker social stories, etc. Look around to find the best links to access within your own classrooms. Visual schedules and choice boards can be quite useful for all learners, not only those with physical and cognitive disabilities! Here are just a few facts about the physical configuration of your classroom to be able to successfully include a student who is a wheelchair user. It is important that you remember the width of the doorway, the aisles and the space for turning. It is all too easy to think of mobility only as our moving through the world. Wheelchairs and scooters come to mind immediately when picturing AT for mobility. A review of merchant information on the web reveals numerous wheelchairs of varied shapes and purposes, such as those designed especially for small children that lower to 6” off the ground so that they may sit with classmates during circle time, and rise to table height; wheelchairs that stand; and wheelchairs that lean back horizontally. And most of us have cheered the wheelchair racers as they speed along in spare, lightweight devices during marathons. With motorized conveyance, those who do not have the strength to “push” themselves along can control their direction and speed with as little as a short puff of breath. 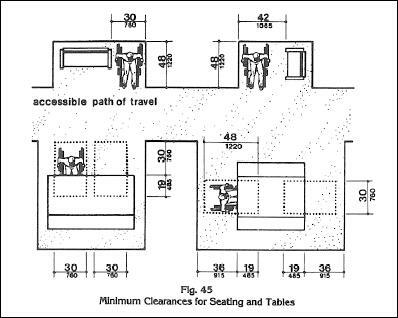 But whichever style of wheelchair one uses, one must also consider the physical environment one is “moving through.” Is the furniture adjustable, the room arranged with wide passageways, and the public transportation furnished with lifts into the vehicles? Throughout this section we will provide examples of high tech, low tech, and even no tech solutions to mobility. Mobility must also consider how we interact and change our environment, and for that we look to the abilities of the person with the disability. Can the individual control her wheelchair manually, without power? If power is needed, will a simple joystick control the wheelchair? Or will the joystick need to be specially positioned and purchased for the child? What if the only reliable muscle movement that the person has is the head? Can a person operate a wheelchair that way? Wheelchairs and scooters are fitted to the individual, just like shoes. One size does not fit all. Occupational and physical therapists do the mobility assessment of the specific needs of a person in a clinical setting. The child’s insurance typically pays for the assessment and the wheelchair. The selection of the specific wheelchair is not an area that parents and teachers usually get involved with, but their understanding of the child’s rhythms and routines—where the child needs to go, when, with whom - are invaluable to therapist. Once the appropriate wheelchair is selected based upon the person’s abilities and needs, those surrounding the child must become competent with ensuring that the devise remains comfortable and effective. Lets’ pretend that you’re a teacher. Now that you have a student in a wheelchair in your classroom, how do you create a learning environment as open and inviting for her as you do for the rest of the kids? 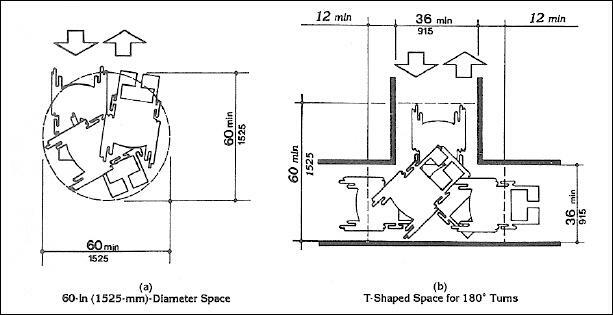 Here are some facts and diagrams to get you started with the physical room arrangement, including width of aisles, space for turning, and height of shelves. They are guidelines provided as a result of the ADA. 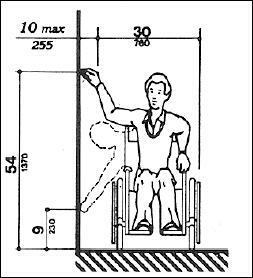 Graphics below taken from the U.S. Department of Justice’s ADA Standards for Accessible Design, retrieved from http://www.ada.gov/stdspdf.htm. So how do we put this information to use? Naturally you want the child using a wheelchair to have access to each part of the room. 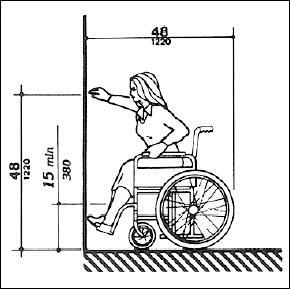 If you look at Figure 1 above, you can see that the minimum width needed for a wheelchair to travel comfortably is 36” and the door width must be a minimum of 32” wide, measuring from the door jam to the open door. The student must be able to open the door with a closed fist, for example, push it open or use a lever type door handle. Swinging the door open, again, figure 1, requires 24 inches of backwards space. Turning around in the room is shown in figure 2. Getting around tables and walls is illustrated in figure 3. 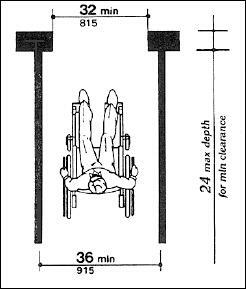 Of critical importance is the ability to sit at each work center, figure 6. Not that all stations within the center need to be accessible, but at least one must be. It’s not fair putting the student with a Plexiglas tray on her wheelchair off in the corner, -- the child needs to sit with his peers at the table, and his classmates need to have a chance to interact directly with him. Therefore, the table needs to provide the child with 30 inches of space (width), with clearance for feet on the foot rests of 17 - 19 inches. Otherwise, bruises or pressure sores may develop by the child unknowingly driving the wheelchair into an object. Then there is reach--reaching for an object on the table, off the bookcase, or to the water fountain button. Keep in mind that these illustrations are for adults in wheelchairs; the actual reach is different for each child. The figures for children are in the table preceding the diagrams. This link is a short video clip from an inclusive preschool in Brockton. Notice all the devices used by the young girl we refer to as “Lucy” so that she is actively included with classmates. The environment must be designed to include all learners—those who are short, tall, wheelchair users, and those with other characteristics who also benefit from special considerations within the environment. When I was a graduate student, we rejoiced when the renovations were made to our Victorian classroom building. Aisles and restroom stalls were widened, water fountain controls lowered, elevators chimed at each floor, Braille topped all the controls, and modern cylinder lights brightly illuminated a site map of the floor above the elevator buttons in the hallway. Imagine our horror when the first student who was blind received a gash in her forehead from the cylinder light fixture when she wanted to push the “down” button and leave the building for lunch! We’re going to use this case study to reinforce the things you’ve been learning about mobility by thinking about their implications for “having fun.”. Read on…. Scott was diagnosed with Duchene MD at the age of three when his parents noticed his unsteady gait and frequent falling down. Scott has full digital mobility (use of fingers/hands and toes/feet) but limited side to side range of motion of his arms. He is able to reach with each hand from 3 inches of his body to 8 inches out from his body. With his right hand he can reach approximately 5.5 inches to the right of midline and with his left hand he can reach three inches to the left of midline. He cannot cross midline with either hand. He can transfer from a sitting position to a standing position with the help of a stand. In addition to Scott’s limited mobility, he has some learning disabilities including dysgraphia. Scott is a strong auditory learner. It became increasingly dangerous for Scott to maneuver around his home and school by walking, even with the grab bars in place. With the support of his IEP team, Scott is now successfully using a power wheelchair to provide independence in mobility. He also occasionally uses his manual wheelchair when the size of the power chair becomes a challenge. A newer challenge for Scott is that his vision is now less clear in the dark, such as when watching a movie. Scott continues to interact well with a fine group of friends, and as a teenager he wants more social independence. Specifically, Scott wants to attend the movies with his friends and accompany them for a day of skiing next month. Your task is to learn about the resources for the movies and for getting onto the slopes with his friends. Scott has already figured out the transportation situation (he’s clearly motivated! ), so please just become knowledgeable about the movies and skiing. Getting Scott to the slopes and the movies with friends. You might start by finding out the types of accessibility features that are available in some theaters for folks with visual and motor impairments. Read about the work that WGBH is doing to make commercial movies in theatres accessible to patrons who are deaf or blind. http://ncam.wgbh.org/mopix/ and http://ncam.wgbh.org/mopix/aboutproject.html. Be sure to watch the Lion King demonstration for a firsthand look at Descriptive Video Service. Do your best to locate a movie theater in your vicinity that would accommodate Scott and his friends and find out some of the challenges they might face. Then, help Scott prepare for the day at the slopes. You’ll find the links above to get you started, and feel free to search for others, too. Be sure to identify the web links for any additional sites you find to be particularly helpful. Describe to us what you have learned that will benefit Scott and others with similar desires for fun. Submit your one page description for Scott’s recreation to me before Monday, December 6th.